The highly significant economic and patient issues around early failure in metal-on-metal total hip and resurfacing replacements have been brought sharply into focus within the public media, for instance the BBC reported Metal-on-metal hip replacements ‘high failure rate’. Similarly the scientific and clinical communities have become acutely aware of this detrimental issue and are entering a debate which focuses on alternative materials and designs for replacement systems. Added to these issues are growing concerns from regulatory authorities on how to effectively test these devices before they are implanted into patients, as the current spate of metal-on-metal failures appear not to have come to light with current assessment methodologies. This resilience must overcome variability in the prosthetic performance that arises from surgical technique (for instance, implant position), pathology, and patient characteristics, all of which have been shown to impact on the rates of failure. The majority of failures beyond 3-5 years are largely the result of wear and the reaction of the body to the particles and corrosion products released during this process. The table below summarises the causes of loosening and related wear in total joint replacements. Past research has focused largely on reducing the overall levels of wear. However, if we accept the premise that wear cannot be eliminated entirely and is an inevitable consequence of motion at an interface, then alternative routes to improving both the long-term survival and resilience need to be sought to allow a greater proportion of patients a trouble-free existence following surgery. Responses in (ii) are linked to tissue necrosis and formation of pseudotumours. Uniquely this project will consider wear debris that are soluble and reduce the propensity for an inappropriate biological response once these particles are released into the joint space. Τhe release of ions that have been shown not to be cytotoxic when from either the coating or debris. An extremely low wearing coating that is comparable to contemporary bulk ceramic bearing systems (which can fail catastrophically and are expensive) and significantly better than rates of wear observed in metal-on-metal articulations (which also release deleterious cytotoxic debris and ions). through reductions in implant failures and subsequent revisions. The programme of research will produce a biocompatible, low-wearing silicon nitride coating, functionally tested utilising cutting edge techniques with a view to preparing the necessary regulatory information, as appropriate. Deliver the necessary regulatory evidence to an advanced stage. The total project funding for LifeLongJoints is in excess of €18M with the European Commission providing €13.317M and the remainder being contributed by the consortium members themselves. The consortium comprises 14 partners of which seven are publically funded organisations, which includes six Universities and one state-sponsored hospital, and an equal number of private sector organisations, of which one is a commercial health care provider. A real strength of the consortium is that they have numerous, pre-existing collaborations including Pan-European projects (e.g. SpineFX, VPHOP and an ERC advanced fellowship, FUNMAT) as well as national large scale programmes of research (see figure below). These linkages reduce both the risk and the learning curve associated with the development of this new initiative. The management structure of the LifeLongJoints project has been designed to be commensurate with the size, duration, work package structure and scope of this highly ambitious project. 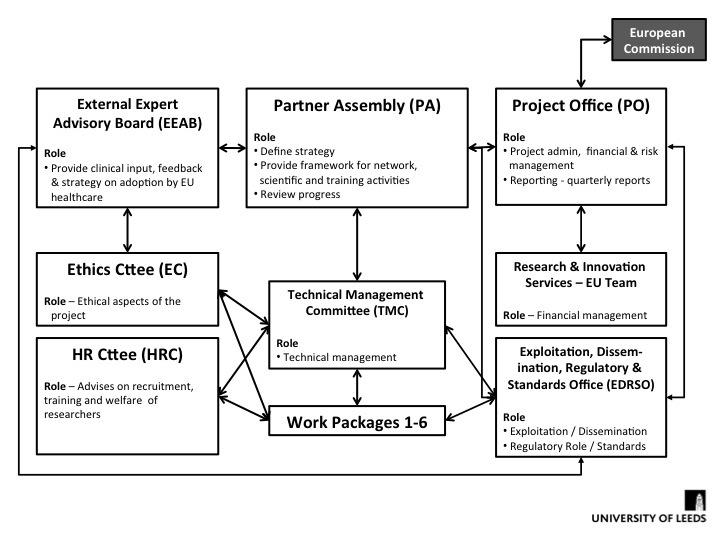 The roles and responsibilities of the component committees are detailed in diagram below. 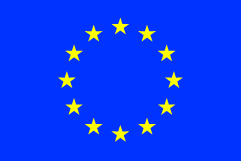 The decision-making structures and tasks of the Consortium, and the responsibilities of Partners regarding the financial and scientific management of the project are formally enshrined in the LifeLongJoints Consortium Agreement (CA), which also sets out clear exploitation (use of knowledge), dissemination and regulatory plans.